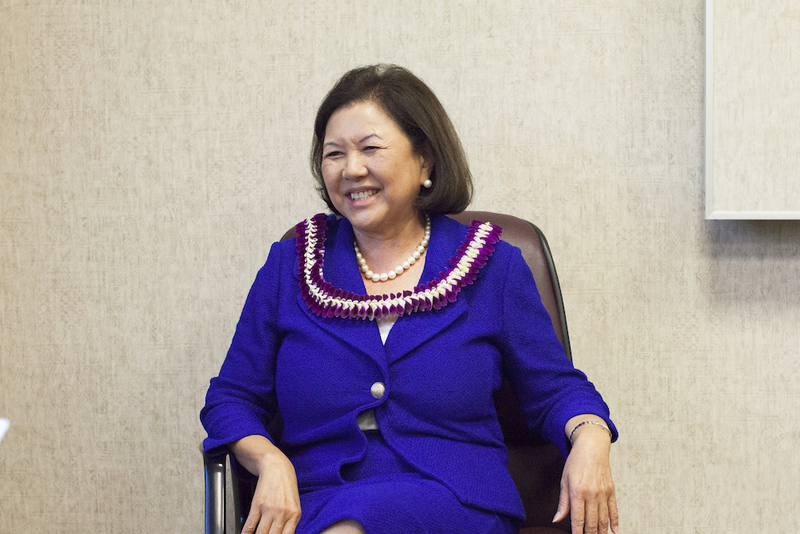 Irene Hirano Inouye is president of the U.S.-Japan Council, a role she assumed in 2009 after the death of her husband, United States Senator Daniel Inouye of Hawaii, who had helped create the council the year before. Before assuming the helm at the council, Inouye spent 20 years as president and founding chief executive officer of the Japanese American National Museum in Los Angeles. Before moderating a Smithsonian/Zócalo “What It Means to Be American” panel entitled “What Role Will Hawaii Play in the Pacific Century?” she talked in the Zócalo green room about playing the accordion, trying to get organized, and why business people are better for non-profits than lawyers. What is your favorite item in the Japanese American museum’s collection? I would say the barracks, which is part of the main museum exhibition. It’s a fragment of building that was used by the U.S. government for the internment of Japanese Americans in Wyoming during World War II. A group of former internees went to Wyoming to help dismantle it and bring it back. It’s the museum’s most significant original artifact. The Life-Changing Magic of Tidying Up by Marie Kondo. I have three residences, so it’s hard to keep track of things, but I realized there are far too many things so I’m trying to be better organized. Little by little, I’m beginning to tidy up. I’d like to have a better memory. I’m pretty good with names and I can associate names with where I met someone. But over the years you meet so many people, it’s just hard to remember. If I could have one of those wonderful memories, that would be great. I like New Year’s. It’s part of the Japanese tradition that the family cooks a lot of Japanese food, and friends and family come by. You think, okay, here’s a new year and I get to do all the things I was going to do before. I would spend time writing to people that I never seem to have enough time to maintain contact with, friends. I’d check to see how they’re doing. I can play the accordion. I still have the accordion that I took lessons on when I was a kid. When I was at the museum, they would have volunteer talent shows and I could sometimes be persuaded to play a number. What’s your favorite California getaway? Napa Valley. Great wine, food, a nice place to visit. I’d want to be a lion. Strong and bold. When I was starting at the museum, one of our major donors and a board member told me, when you build the board, build it with business people. Don’t have too many lawyers at the same time. I thought it was funny, but over the years I’ve realized it’s good advice. Non-profits have to be very mindful of the bottom line. Having the resources to be able to fulfill the mission of the organization, and to have impact. I am passionate, dedicated, optimistic.